They’re one of fall’s most visual offerings, foods so colorful you make them the centerpiece on your Thanksgiving table. Or maybe you like to pile these jewel-toned veggies on the stoop next to the jack-o’-lanterns come Halloween. What you really should be doing is eating them, those brightly striped, sometimes weirdly shaped, more often than not hard-as-a-rock autumn gems known as winter squashes. I came late to the squash party. For much of my cooking life, I relegated this quintessential fall offering to the “no way, no how” list of ingredients. I’m bad enough with a chef’s knife, let alone a cleaver (I once managed to nearly take off a fingertip while slicing cake), so trying to peel and then whack a Hubbard or acorn squash into cookable pieces seemed a guaranteed trip to the ER. Better to limit my family’s squash-eating to the easy summer varieties such as zucchini and yellow crookneck, which are a snap to slice and dice into a stir-fry or gratin or grate into a chocolate cake. My kids, I’m sad to say, didn’t put up much of an argument. While all happily gobbled (pureed) squash as babies, by the time they were in elementary school none would have touched butternut squash with a 10-foot pole, let alone a fork. Then two years ago, a copy of “Martha Stewart’s Dinner at Home” landed on my desk. She’s a crafty one, that Martha, practically Double Dog-daring us into rethinking everything we thought about squash with one simple, delicious-sounding recipe. Today, one of my daughter Catherine’s favorite fall dishes is her “Gratineed Baked Squash Halves,” or acorn squash baked with garlic-and-sage-infused cream and then topped with melted Gruyere. She starts asking for it about the time school starts. Small and sweet sugar (pie) pumpkins — yep, they’re actually a type of squash — also are extremely easy to prepare for cooking; just wash, cut in half, remove the stem and scrape out the seeds and fibers. Then, they can be roasted, steamed, grilled, boiled, microwaved, grated or stuffed in any way you can imagine. What I’m learning, with the help of several new cookbooks, is that the winter squash is well worth exploring. You can’t beat its versatility. Appetizers, soups, stews, side dishes, breads and muffins, vegetarian entrees, desserts — there’s a way to sneak squash into virtually any meal. Creative types even can use the shell as a serving bowl for soups and stews. And don’t forget about the seeds, which can be toasted for a snack or garnish. Happily, the weather’s been kind in Western Pennsylvania, so there’s a wide variety of cooking pumpkins and squashes available at your local grocery store and farmers market. Among the offerings at Janoski’s in Clinton, for example, are acorn, butternut, spaghetti and delicato squashes; Schramm Farms in Penn, Westmoreland County, has all that plus those thick and bumpy Hubbard squashes, which, once you hack your way to their dense yellow-orange flesh, prove mighty tasty. At Farmers Market Co-op of East Liberty, Brian Greenawalt of Greenawalt Farm also has green and orange kabocha (also known as Japanese pumpkin), which has an exceptionally sweet flavor. Adjust oven rack to middle position and heat oven to 300 degrees. Place cardamom, allspice and star anise in a small skillet over medium-low heat; toast spices, shaking the pan often, until fragrant, about 4 minutes. Remove from heat and grind in a spice grinder; set aside. In a small bowl, toss apple with lemon juice and set aside. Place squash on a rimmed baking sheet or casserole dish skin-side down; brush flesh of squash with butter and honey; evenly sprinkle ground spices, sugar, salt and pepper over the top. Place on apple half with juices into the cavity of each squash; add apple cider to inside of cavity, if desired. Bake, basting occasionally, until squash is tender and offers no resistance when pierced with a paring knife, 11/2 to 2 hours. Remove from oven; discard apple and let cool for 10 minutes. Using a fork, scrape cooked squash into a medium bowl and toss to separate the strands. Serve warm. These were so much easier than I anticipated, and yummy! Don’t let the oil get too hot and pay attention to flip times, or you’ll end up burning the second and third batches. To make doughnuts: Sift flour, baking powder, salt, nutmeg and pumpkin pie spice together into a bowl and set aside. In a stand mixer fitted with a paddle, mix sugar and shortening for 1 minute on low speed, until sandy. Add egg yolks, then mix for 1 more minute on medium speed, scraping the sides of bowl with a rubber spatula, until mixture is light colored and thick. Add dry ingredients to wet ingredients in 3 separate additions, alternating with sour cream and pumpkin, mixing until just combined on low speed and scraping the sides of the bowl each time. The dough will be sticky. Transfer dough to a clean bowl and refrigerate, covered with plastic wrap, for 45 minutes or up to 24 hours. Meanwhile, make glaze by placing confectioners’ sugar, corn syrup, salt, pumpkin pie spice, pumpkin and vanilla in the work bowl of a stand mixer fitted with a paddle. With machine on medium speed, add hot water in a slow, steady stream, and blend until all of the sugar has been incorporated, scraping the bowl a few times is necessary. Set aside. Using a candy thermometer to measure, heat oil (at least 2 inches deep) in a large pot or high-sided frying pan to 325 degrees. Roll out chilled dough on a floured counter or cutting board to 1/2-inch thick, flouring the top of the dough and rolling pin as necessary to prevent sticking. Cut into as many doughnuts and holes as possible, dipping the cutter into flour before each cut. Fold and gently reroll dough to make extra holes and cut again. Shake excess flour off doughnuts before carefully adding them to the hot oil a few at a time, taking care not to crowd them. Once doughnuts float, fry to 15 seconds, then gently flip them. Fry for 75 to 90 seconds, until golden brown and cracked, then flip and fry the first side again for 60 to 75 seconds. Transfer to a rack set over paper towels. 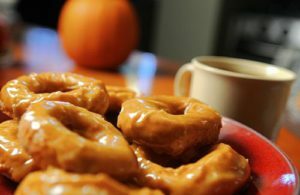 While doughnuts are still quite hot, dip the side with the deepest cracks on each into the warm glaze. Let dry on cooling racks, glazed side up, for about 15 minutes. Makes 1 dozen doughnuts and holes. In a large saucepan over medium heat, saute the onions and garlic in the olive oil for about 5 minutes. Add red pepper flakes, curry and coriander to pan, and saute for about 5 more minutes; be sure spices are well coated with the hot oil. Add pumpkin and vegetable broth. Stir well and bring soup to a boil. Reduce heat and simmer for 15 minutes. Transfer soup, in batches, to a blender or food processor and blend until smooth. Return soup to the saucepan. On low heat, add coconut milk and maple syrup. Adjust seasonings, adding salt and cayenne to taste. 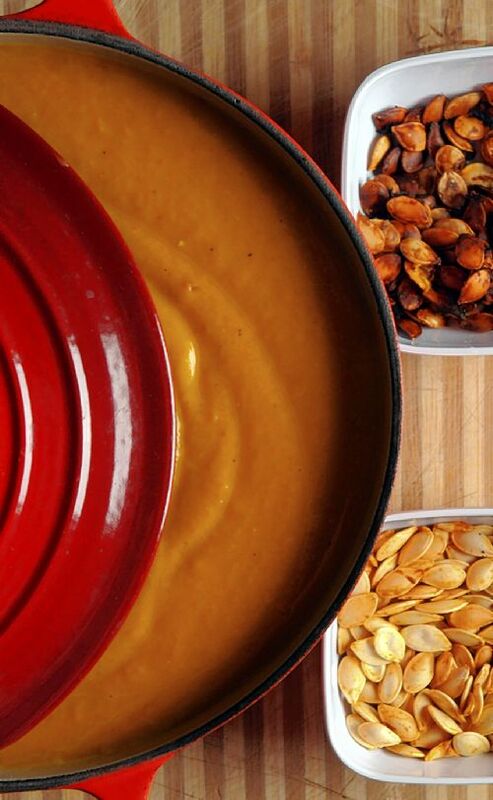 Garnish each bowl of soup with a sprinkle of pumpkin seeds. 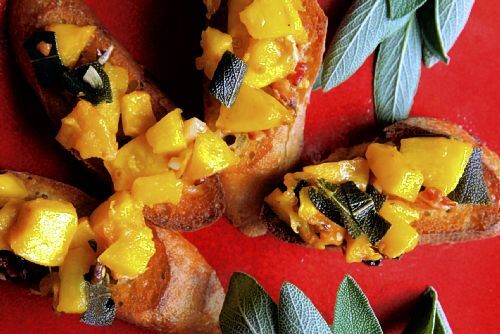 This easy appetizer was served at Pittsburgh Public Market’s Green Gathering workshop in September. Also terrific as a side dish. Place pancetta, garlic, pumpkin, chile flakes and brown sugar in bowl, toss to coat. Place in baking dish and bake 30 to 35 minutes, or until pumpkin is browned. While the pumpkin mixture is still warm fold in sage leaves and allow to wilt. Place the lemon juice and olive oil in a bowl and whisk. Toss pumpkin mixture with the dressing. Place a spoonful of the pumpkin on a slice of toasted baguette. Heat oil in a large skillet or saute pan over medium-high heat. Add onion and cook for 3 minutes. Add peppers and chicken and cook for another 3 minutes. Stir in fresh and canned pumpkin, tomatoes, chili powder, cumin, hot sauce and salt. Cover, reduce heat and summer until chicken is tender and no longer pink, the pumpkin is easily pierced with a fork and sauce thickens, about 10 to 15 minutes. When chicken is cool enough to handle, shred it and return to pan. Stir in lime juice and cilantro and let the mixture sit while you heat the tacos. On a griddle or skillet, over medium heat, warm tortillas for 1 minute on each side. Place 1 on each of 6 plates and divide filling among them. Combine yogurt and sour cream in a small bowl. Top each taco with yogurt mix, cheese, avocado, lettuce and salsa. Fold in half as you eat them. Heat half the olive oil in a saucepan on medium heat. Add butternut squash and salt and pepper, and saute until squash is fork-tender. (If you boil the squash, it will retain too much water.) When squash is fork-tender, transfer it to a big mixing bowl. With the back of a fork, work it until it’s even mashed. Add ricotta cheese, 1 cup of Parmigiano, egg and about 1/3 of the flour, and mix everything together. Keep adding flour, a little at a time, until everything is mixed thoroughly and forms a dough. With your hand, scoop a bit of the mixture and roll it into a ball about the size of a golf ball. Keep going until you’ve used up all the dough. Place gnudi balls in a pot of boiling salted water for about 1 minutes or unitl they float to the surface. Drain and plate. Drizzle with olive oil and sprinkle with remaining Parmigiano. Why should grownups, or maybe just people with teeth, have all the fun when it comes to pumpkin? This Cuban baby food is perfect for children ages 6 months and older. In a large heavy saucepan, cover pumpkin pieces with 6 cups cold water and bring to a boil. Reduce heat to medium-high, and continue cooking until pumpkin is very tender (about 20 minutes). Do not add salt or any seasonings. Drain and transfer to a food processor. Add chicken pieces and butter, and process until very smooth. If desired and your child is old enough, add broth gradually as your process to get the right consistency. Serve immediately, making sure it is not too hot for the baby, or freeze (in ice cube trays) for future use. Road-racing trips: Why not build a vacation around your competitive spirit? When it comes to road races, nothing beats the classic 5K. Last year alone, the 3.1-mile distance chalked up nearly 4.7 million finishers, or 36 percent of all race finishers in 2010. Yet the half marathon is doing its best to catch up. For the first time in the U.S. last year, more athletes completed a 13.1-mile race (1.38 million) than finished a 10K (1.33 million). That’s triple the number of half marathoners in 2000, when just 485,000 runners crossed the finish line. Women in particular have fallen in love with the half marathon, accounting for almost 60 percent of the field. It’s long enough for it to feel like a challenge but not so long that you have to kill yourself training for it. “It’s the hottest race in the world right now,” says Patrice Matamoro, race director of Pittsburgh’s full and half marathons, which like other well-known large races such as the Big Sur, Marine Corps and Houston marathons and Disneyland half marathon sold out last year with record-breaking registrations. Running an endurance race in your hometown is an accomplishment like no other. But it can be even more motivating, not to mention a heck of a lot more fun, to build a vacation around it. Many of the country’s largest races, in fact, draw more out-of-town visitors than local runners with their weekend-long events. It’s easier than you might think to plan a destination race. Most every major city in the U.S. stages a half or full marathon (www.marathonguide.com), so it’s just a matter of timing. The popular Rock ‘n’ Roll series of marathons and half marathons, for instance, which debuted in San Diego in 1998, now counts 24 cities on its U.S. tour, along with two in Europe. If you’re a newbie, a number of charities provide half and full marathon training and support in exchange for fundraising for the cause. One of the largest, Team in Training, which raises money for the Leukemia & Lymphoma Society, has programs that take runners to the Honolulu Marathon in Waikiki Beach and the Mayors Marathon in Anchorage, Alaska, among other places. So which races are worth the time and effort? Here, we offer some full and half marathons with bucket list appeal. 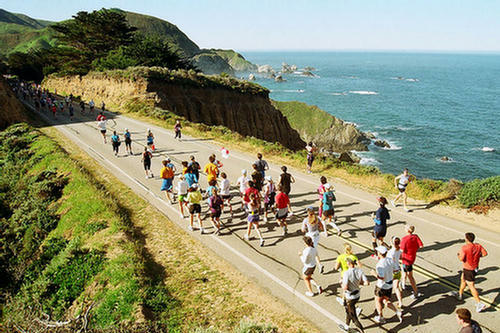 “If we were told that we could run only one marathon in our lifetime, Big Sur would have to be it,” says Bart Yasso, a longtime marathoner with Runner’s World magazine who spearheads a program that works with more than 7,000 races. 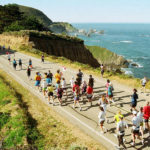 There’s not a more spectacular spot in the country for a race, and if you’re not up to doing the marathon held each April on Highway 1 along the Pacific Ocean, the half will give you an equally dramatic view on the Monterey Peninsula each November. The Nov. 20 half marathon is sold out, but either one is definitely worth a trip to California. Monterey, two hours south of San Francisco, is the headquarters for both races. What to see: Monterey Bay Aquarium; Cannery Row (made famous by John Steinbeck); Carmel-By-the-Sea that offers a beautiful downtown of galleries, boutiques and restaurants; and the famous 17-Mile Drive at Pebble Beach. There are also myriad parks, beaches and spas. The 24-year-old San Francisco Marathon introduced two half-marathon courses this year — all held in July. It gives half-marathoners the unusual choice of running either the first half or the second half of the marathon route. The marathon is a mostly flat, loop course, starting and finishing on the Embarcadero (near the Ferry Building). The route goes by Fisherman’s Wharf, the Marina, across the Golden Gate Bridge and back, through the Presidio and into Golden Gate Park, then down famous Haight Street and through the Mission, Potrero and Mission Bay districts, then under the Bay Bridge to the finish. What to see: Alcatraz Island, Coit Tower, cable car rides, Ghirardelli Square, Pier 39, Fisherman’s Wharf, Walt Disney Family Museum, Bay cruises, Sausalito, etc. What started in 1972 as a simple two-loop run around an island in Oregon’s Columbia River has grown to one of the nation’s favorite destination races. Nearly three-quarters of its participants are from out of state. It’s particularly popular with women, who account for almost 60 percent of finishers. The event enjoys a reputation as one of the “friendliest, best-organized, most family-oriented” races in the country. Here’s why: Not only does the course stay open for eight hours to accommodate walkers, but it also offers more entertainment than any marathon in the U.S. — this year, 76 groups are scheduled at 53 stations — and lots of goodies in the race’s swag bag. “Our goal is to treat everyone as a winner,” says event director (and Pittsburgh-area native) Les Smith. What to do and see: Dozens of hiking trails of varying difficulty are close to the city and in the Columbia River Gorge. Nearby Willamette Valley is the heart of Oregon’s wine country, with more than 200 wineries. Portland also boasts museums, public gardens and great restaurants. The Portland Saturday Market (Mar.-Dec.) is the nation’s largest weekly open-air arts and crafts market. Details: Next race is Oct. 7, 2012, but you better be quick if you plan on signing up for the half — it sells out in January. www.portlandmarathon.org. Dubbed the “Most Beautiful Urban Marathon in America,” this course along the Mississippi River starts in downtown Minneapolis and finishes at the State Capitol in St. Paul. With no climbs more than 100 feet long and a downhill finish, it’s a fast course. And you can’t beat the fall scenery, which takes runners past four lakes and up tree-lined boulevards to cheers of encouragement from 300,000 spectators. Held the first Sunday in October, the weather is usually cool but not cold, which makes for great racing. There’s no half marathon, so if you haven’t yet worked your way up to 26.2 miles, you’ll have to settle for a 10-miler on race day or 10K the day before. What to see and do: The Mall of America in nearby Bloomington has 500-plus stores and 50 restaurants. There also are top-notch restaurants and nightlife in town, along with museums, boutique shopping and bike riding along the Mississippi. Do you feel lucky? How can you not when the neon lights of Las Vegas’ famous Strip are illuminating your run. In the past, this stop in the popular Rock ‘n’ Roll series of races started in the predawn darkness. This year, marathoners will span all eight lanes of Las Vegas Boulevard, starting at 4 p.m. (the half marathon gets under way at 5:30 p.m.). Some 40,000 runners are expected to participate in the two races, which begin and end at Mandalay Bay Resort & Casino, making it the world’s largest nighttime running event. Music makes up the heart and “sole” of this event, with live bands at every mile. There are also a quickie wedding or vow renewal at the “Run Through Wedding Ceremony” and lots of Elvis impersonators on the course, which is about as flat and fast as they come. You’ll need that advantage: Racers have just 41/2 hours to complete the marathon, and four hours for the half. What to see and do: You’re in Vegas, baby! Play the slots, see a show, take a ride in America’s largest indoor amusement park, stuff yourself silly at a celebrity chef’s restaurant and shop in one of several casino malls. A Boston qualifier, the course takes its 26,000 runners through neighborhoods in Cincinnati and in Covington and Newport, Ky., across the Ohio River, with a swine-line finish (and victory party) at Yeatman’s Cove on the waterfront. What to see and do: Visit the world’s largest animatronic dinosaur park, take a zipline adventure or riverboat ride on the Ohio River, visit the zoo. Cincinnati features great shopping and dining and several wonderful museums, including the Harriet Beecher Stowe House. Details: Next race is May 6, 2012. www.flyingpigmarathon.com. The famed Philadelphia Museum of Art — one of the nation’s largest museums — serves as a stunning backdrop for both the start and finish of this 18th annual event. Recognized for its not-too-difficult but still-challenging terrain and beautiful scenery, the races are run entirely within the City of Brotherly Love’s historical limits: past Independence Hall, the Betsy Ross House on the picturesque streets of Old City, and more. What to see and do: Philadelphia is one of the country’s most culturally vibrant cities, with dozens of museums, historical attractions and artistic venues. It also has a vibrant nightlife, great shopping along Rittenhouse Row and award-winning restaurants. One local (and inexpensive) must: the cheesesteaks at Pat’s King of Steaks in South Philly. This event in Duluth, Minn., began in 1977 when a group of local runners planned a scenic race along the north shore of Lake Superior from Two Harbors to Duluth. Taking its name from Grandma’s restaurants, which served as its first major sponsor, the event has grown to become the 17th largest marathon in the country, drawing 17,000 participants for the weekend events. It introduced the half marathon in 1991. The race’s relatively flat terrain makes it ideal for those tackling their first marathon. But if it’s a hot day, be warned there’s little shade along the route. There’s lodging all over downtown, or you might try bunking in the residence halls at the University of Minnesota at Duluth, just up the hill from the lakeshore. where nearby there’s a cool “farm-to-table” restaurant for brunch — At Sara’s Table/Chester Creek Cafe, (1902 E. Eighth St., 1-218-724-6811). What to see: Duluth is 21/2 hours from Minneapolis, so you can visit both cities over a weekend. Duluth has the Great Lakes Aquarium and Lake Superior Railroad Museum; Minneapolis-St. Paul is packed with museums, dining and shopping, as well as biking trails and other activities around its 22 city lakes. There’s still time to register for the events on Dec. 11. These are particularly popular courses for those hoping to get a PR (personal record) because of the almost perfect running conditions. The point-to-point courses are mostly downhill and temperatures at the start (7:30 a.m. for the marathon, 7 a.m. for the half) are in the high 30s and rise to about 65 degrees by late morning. The half marathon course follows the last 13.1-miles of the route. What to see and do: Hiking, biking, horseback riding, rock climbing, caving in the many parks and canyons. Or visit the Arizona-Sonora Desert Museum, Catalina State Park, Tohono Chul Park, Fred Lawrence Whipple Observatory, Pima Air & Space Museum. Plus lots of shopping, dining and spas. Details: Next race is Dec. 11. www.tucsonmarathon.com. Looking to work off Thanksgiving dinner? This pre-Christmas event was voted “Best Marathon in Texas” for the past four years by Competitor Magazine. Organizers expect 25,000 runners to take their marks this year at historic Fair Park. The full marathon course winds through downtown Dallas’ arts district and hip Uptown area, along Turtle Creek and a loop around White Rock Lake. The downhill finish takes runners past the historic Swiss Avenue mansions on the return to Fair Park. Course entertainment includes 40 live bands. What to see and do: Dallas boasts the largest contiguous urban arts district in the U.S., the center of which is the Dallas Museum of Art. The popular Uptown, West Village and downtown West End Historic districts feature specialty shops, eclectic cafes and restaurants. Or head to the upscale Galleria to people-watch for celebs. The Sixth Floor Museum at Dealey Plaza examines the life and death of President John F. Kennedy. Details: Next race is Dec. 4. www.runtherock.com. These point-to-point sea-level races, which bring about 7,500 runners to town, also are relatively flat and fast. Yet the real draw is the North Carolina scenery, which includes the tallest natural sand dune in the eastern U.S., sea oats, wildlife and sweeping sound views. The course runs north to south, so the late fall wind is behind you. Marathoners begin their journey at historic Kitty Hawk, run past the 60-foot-tall Wright Brothers Monument on Big Kill Devil Hill and at mile 10 switch to a trail run through Nags Head Woods Nature Preserve, one of the few maritime forests on the East Coast. Both races end on storied Roanoke Island. What to see and do: The blue-green waters of the Atlantic are too chilly for swimming in late fall. But it’s still warm enough for fishing, golf, hiking, kite flying and hang gliding (Kitty Hawk Kites is the largest hang gliding school in the world). OBX also has great seafood restaurants, quaint inns, shopping and five historic lighthouses. This all-women’s race in New York City’s Central Park each spring makes a perfect girls getaway. It began in 2004 for women 40 and older by More Magazine, which celebrates the lives of women in their 40s and 50s. But More has since partnered with Fitness Magazine and broadened participation to include girls and women, ages 12 and over. On April 3, it drew 8,000 participants from 48 states and 18 foreign countries — making it one of the largest all-women’s races in the world. The 13.1-mile course follows the park’s popular inner loop. What to see: The race is held Sunday morning, so you’ve got most of the weekend to explore the Big Apple — the museums, monuments, Broadway shows, shopping and dining. Like so many parents I know with physically active kids, I spend a lot of time at school and community athletic events. In the last 25 years of parenthood, I figure I’ve cheered my sons and daughters on at hundreds of games and practices. Not that I’m complaining: my poor parents had to go to (what probably felt like) hundreds of my 4-H and other horse shows when I was a kid. This fall my three youngest are playing three different sports — soccer, volleyball and cross country — so many nights I go directly from the office to the playing field. That, in turn, leads to the time-honored tradition of eating dinner at the concession stand. Much of the time the home- and away-team booster groups offer fans a pretty decent meal — say, a sandwich or local special so delicious I wished it was my recipe. 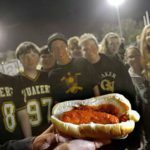 At Freedom Area High School football games, for instance, the choices include gyros from Ambridge Italian Villa and hot sausage sandwiches made with homemade sausage from the Lil’ Bulldogs youth football boosters; you also can nosh on halushki, french fries, cinnamon buns and saucy pepperoni rolls. Yet, I’ve also found myself sometimes wishing the dish simmering away in the slow cooker could be … better. Not to make the booster moms who already are stretched to the limit feel even more guilty or inadequate — I have to take my turn cooking for the concession stand, too — but seriously. You’re OK with a meal that comes in a Fritos bag? I’m talking, of course, about the darling of concession stand goodies, the Walking Taco. Ever since this hand-held treat made its debut at the 1982 World’s Fair in Knoxville, Tenn., it’s been a huge crowd pleaser. Servers like the dish because it’s fast and easy to throw together; fans adore it because the greasy mix of Fritos, taco meat, grated cheddar and sour cream (plus chopped jalapenos, if you’re feeling adventurous) is so tasty. “We always sell out of them,” said Barb Pukylo, who heads the concession stand for the Avonworth Eagles youth football league in the North Hills. It sells 70 or more during a game. Tacos-in-a-bag also are a fan favorite at South Fayette High School, said Kathleen Bryer, who with her fellow boosters served up dozens last Saturday during an all-day girls’ volleyball tournament in the high school gym. Nearly as popular are the group’s foil-wrapped baked potatoes, kept toasty in a pizza warmer and served with cups of sour cream, bacon bits and butter. “They sell like hotcakes,” said Mrs. Bryer, whose group also offers homemade cabbage and noodles, macaroni and cheese and, in a nod to more healthful eating, cups of fruit salad. This is good news, because I’m of the opinion that just because you’re at a school sporting event doesn’t mean you have to eat like teenager. Walking tacos might delight kids, but don’t grownups want “real” food for your dinner-on-the-go? Concession stand cooking, understandably, has its challenges: you don’t always have a lot of equipment for cooking and/or reheating, or room to maneuver. You also need to prepare something that can be easily held or perched on the lap while sitting in the bleachers, lends itself to being served fast (most of your customers are going to be lining up at halftime) and doesn’t create a lot of waste. That’s another reason the walking taco is so popular — all you need to serve it is a spoon. Because concession food is donated, and meant to feed a crowd, it also has to be a dish that won’t cost the cook an arm and a leg in ingredients. Thus, we offer some dishes that not only are easy to make and keep warm in a slow cooker, but won’t break the bank, even when they’re doubled. We know the kids will still go crazy over the walking tacos, but we say: shouldn’t mom and dad have something to shout about, too? Skin and bone the cooked chicken and shred meat into bite-sized pieces. Set aside. Heat a heavy soup pot over medium-high heat and add vegetable oil. Add onion and saute until it becomes soft, about 4 minutes. Add garlic to pot and cook for 2 minutes. Add chile puree, salt, black pepper, sugar, oregano and cilantro. Cook for 2 minutes, stirring constantly to avoid scorching. Add tomatoes and chicken stock and bring soup to a boil. Turn heat to low and slowly simmer soup for 20 to 30 minutes. Taste soup and adjust the seasoning, if needed. Add chicken and lime juice. To serve, place a few tortillas in the bottom of each bowl. Ladle hot soup over the tortilla chips, and top with a dollop of sour dream, diced avocado, shredded cheese and a sprinkle of cilantro. Combine all ingredients in a small saucepan and bring to a simmer. Cook at a low simmer for 2 minutes, then cover the saucepan, turn off heat and allow chiles to steep for 15 minutes. Transfer the solids and liquid to a blender and puree until smooth. Preheat oven to 300 degrees. Pat chicken dry with paper towels and season with salt and pepper. Heat 1 tablespoon oil in a large Dutch oven over medium-high heat until just smoking. Add half of the chicken and brown lightly, 6 to 8 minutes; transfer to bowl. Repeat with 1 more tablespoon oil and remaining chicken. Add remaining 1 tablespoon oil to pot and heat over medium heat until shimmering. Add onions and 1/4 teaspoon salt and cook until softened, 5 to 7 minutes. Stir in garlic, jalapenos, chipotle and thyme and cook until fragrant, about 30 seconds. Stir in flour and cook for 1 minute. Stir in wine, scraping up any brown bits. Gradually whisk in broth, smoothing out any lumps. Stir in carrots, bay leaves and chicken with any accumulated juice and bring to a simmer. Cover, place pot into the oven, and cook until chicken is very tender, 50 to 60 minutes. Remove pot from oven and remove bay leaves. Stir in hominy, cover and let stand for 5 minutes. Stir in cilantro and season with salt and pepper to taste before serving. In a large heavy skillet, cook bacon over moderate heat until fat is rendered. Add garlic and onion and cook, stirring until onion is softened. Add ground chuck and cook over moderately high heat, stirring and breaking up lumps, until browned, 3 to 4 minutes. Pour off excess fat. Stir in salt, chili powder, cumin and tomato paste. Slowly add water and simmer, adding additional water if mixture thickens too much. Chili should be loose but not soupy. Add beans and heat through. Divide Fritos between 4 wide shallow bowls and ladle chili on top. Sprinkle with cheese. Garnish with jalapenos and chopped onion. Combine chili powder, cumin seeds, cayenne, cinnamon, oregano, bay leaves and brown sugar in a small bowl; set the spice mixture aside. Add beef to a medium bowl and season with pepper and 1 tablespoon kosher salt. Heat 2 tablespoons of oil in a 12-inch or larger skillet over high heat. Add enough beef to fill the pan and cook until nicely browned on one side, about 2 minutes. Turn the pieces over and cook for another 2 minutes. Transfer the browned beef to the crock of a 6-quart slow cooker. Repeat with remaining beef, adding remaining vegetable oil between batches as necessary. Add onions, celery and 1 tablespoon of remaining salt to skillet and cook, stirring, until vegetables begin to soften, about 2 minutes. Add garlic, jalapeno and spice mixture and cook for 1 minute longer. Pour in beer, tomato paste and crushed tomatoes and simmer for 3 minutes. Stir in chocolate, masa harina and remaining 11/2 teaspoons salt and cook for 1 minute longer. Transfer this mixture to the slow cooker. Cover and cook chili on high, undisturbed or stirring only once during cooking, for 6 hours, or until the beef is very tender. Remove the bay leaves and stir in cilantro and parsley. Serve the chili hot in bowls, topped with grated cheese, chopped green onion and sour cream. Preheat oven to 350 degrees. Line 2 sturdy cookie sheets with parchment paper or silicone liners. In a mixing bowl, cream butter and peanut butter with an electric mixer on medium speed until combined. Scrape the sides of the bowl and the beaters and add the brown sugar. Beat until light and fluffy, about 3 minutes. Add the egg and mix to combine. By hand, fold in flour and baking soda a few times. Add the granola and chocolate chips and fold until the dough is well mixed. Drop dough by heaping tablespoons about 2 inches apart onto the prepared cookie sheets. Bake for 15 minutes, turning the pans and rotating from top to bottom halfway through the same time. The cookies should have a slightly golden edge and appear a little fluffy and soft. Baking them longer will result in crispy-crunchy cookies rather than soft, chewy ones. Let cookies set for a few minutes, then transfer to a rack to cool completely. These bite-sized cupcakes allow you to eat something sweet without the guilt. They’re simple enough that you can bake them right before the game, provided you get one of your kids to unwrap all the peanut butter cups — that took more time than mixing the batter. Preheat oven to 350 degrees, with racks in upper and lower thirds. Line 2 24-cup mini muffin pans with paper liner. In a medium bowl, whisk together flour, baking powder and salt. In a large bowl, using an electric mixer, beat together peanut butter, butter and brown sugar on high until pale and fluffy, about 3 minutes. Beat in egg and egg yolk, scrpaing down bowl as needed. With mixer on low, beat in flour mixture, buttermilk and vanilla until combined. With a large end of a melon baller or spoon, place 2 teaspoons batter into each muffin cup, then press a peanut-butter candy into each center until batter aligns with top edge of candy. Bake until puffed and set, about 10 minutes, rotating pans halfway through. Immediately place a piece of candy corn on top of each cupcake; let cook completely in pans on wire racks. Store in single layers, in airtight containers, up to 3 days.